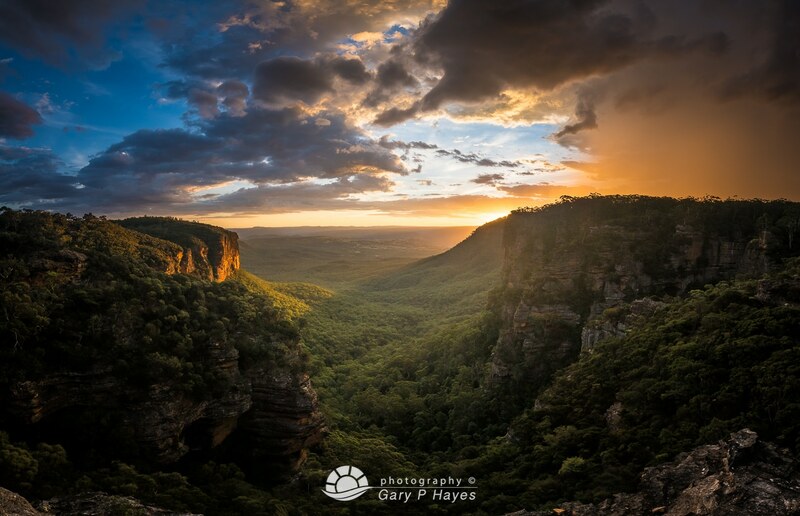 ABOUT: Therabulat lookout (or more correctly Dhurabulla, indigenous n ame) is a small fenced ledge just to the south of North’s Lookout but provides a much clearer view down Nellie’s Glen with fantastic cliffs each side to frame the shot down toward the Megalong Valley. PHOTO EQUIPMENT TO BRING: A good tripod as the glen below will mostly be in shade at sunset and the sky a brilliant red/orange (if you are lucky). A 24mm can capture a good view but 16mm or 14mm is better, and consider vertical pan stitches too. A grad for the sky or do 2 or more shot blends is critical here. GETTING TO THE SPOT/S: Park at the small T-junction at the end of Stuarts Rd (without blocking the road). Walk to the left and you will see a sandy track going off into the bush on the right after 10m. Follow this for approx 10 minutes and as the trail starts to go downhill and at a bend to the right with a fallen tree, you will see an obvious trail going off to the left (the only one). Follow this for about 3 mins to the lookout. Is this also a good spot for sun set in beginning of May?